The Waffen-SS was a multi-ethnic and multi-national military force of the Third Reich. The Waffen-SS saw action throughout World War II and grew from three regiments to over 38 divisions, and served alongside the Wehrmacht Heer regular army, but was never formally part of it. Unfortunately, due to sales rights restrictions, we cannot offer Dictionnaire de la Waffen-SS Tome 4 for sale in your country. The Waffen-SS was a multi-ethnic and multi-national military force of the Third Reich. The Waffen-SS saw action throughout World War II and grew from three regiments to over 38 divisions, and served alongside the Wehrmacht Heer regular army, but was never formally part of it. It was Adolf Hitler's will that the Waffen-SS never be integrated into the army; it was to remain the armed wing of the Nazi Party and to become an elite police force once the war was won. 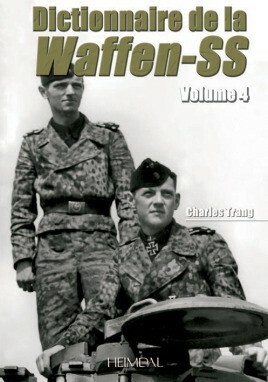 Volume four in this series on the Waffen-SS presents the independent units, brigades, regiments, and those units organically formed of the army corps. This work is an indispensable complement to the histories dedicated to the Waffen-SS divisions.